ZWEIBRÜCKEN –August 9, 2018 – “The Terex® RT 45 is a tough, tried-and-true machine that stands out due to its excellent price–performance ratio and ease of operation. So it was only natural that it would be our choice,” Galvaswiss Maintenance Manager Ernst Müller says as he explains that his company will be using its new acquisition to load and unload trucks. 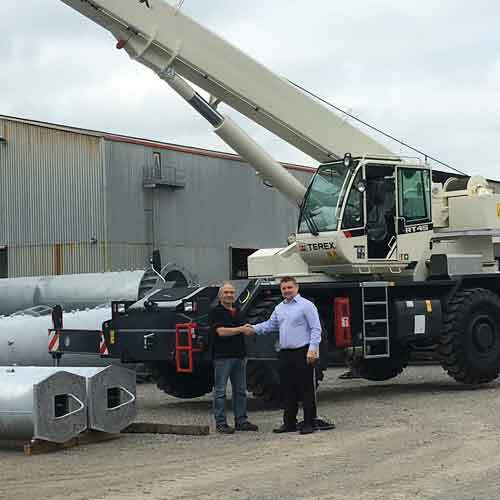 The new crane was handed over by Terex Cranes Senior Sales Manager Christian Kassner. In addition to the Terex RT 45 rough terrain crane’s excellent reliability, the way the whole process worked proved to be another crucial element in the Swiss company’s purchase decision: “Everything went perfectly smooth – from our visit to the manufacturing plant in Crespellano, through the way the contract terms were drawn up, to the on-time handover,” Ernst Müller happily summarizes. And the fact that after-sales support is just around the corner in Winterthur means that the RT 45 has everything going for it as it heads to its job. Galvaswiss galvanizes, paints, finishes – this is the slogan that guides the company as it offers its comprehensive services at three locations in Switzerland and one in Germany. With experienced and highly qualified personnel and state-of-the-art equipment, Galvaswiss provides appealing finishes and ensures that steel and metal objects will keep their value for a long time throughout a maintenance-free period lasting up to 45 years. The company serves all of Switzerland, Southern Germany, Austria, and border areas in France.